BEST CHEESECAKE EVER!! With all those raspberries we got from Matt’s grandparents, we had to make something incredible! What is better than cheesecake? We have family dinner on Sunday’s and everyone is supposed to bring something to contribute and this was my awesome dessert and it was a big hit!! 2. Mix Oreo cookie crumbs and butter; press onto bottom of 8- or 9-inch square pan. 3. Melt 2 oz. chocolate as directed on package. 4. Beat room temperature cream cheese, sugar and vanilla in large bowl with mixer until well blended. Add melted chocolate and mix well. Add eggs, 1 at a time, mixing on low speed after each just until blended. Pour over crust. 5. Bake 35-45 minutes or until center is almost set. 6. In a pot mix danish dessert with 1 cup of cold water and bring to a boil, allow to boil for one minute. Then dump in 1 cup of fresh raspberries. 7. Cool Cheesecake completely. Then dump danish dessert and raspberry mixture on top. 8. Refrigerate for 4 hours. 9. Melt remaining 2 oz of chocolate, place in a plastic Ziploc bag. Cut the corner and drizzle chocolate on the cake. 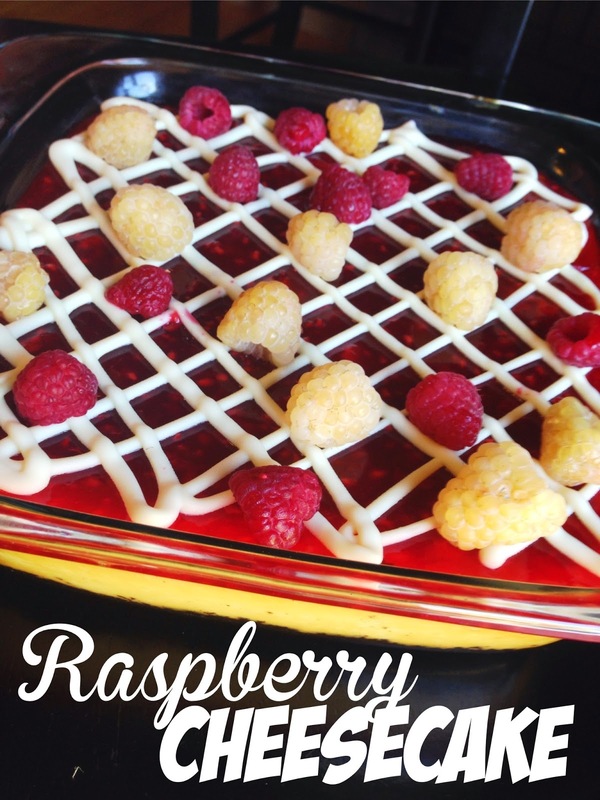 Decorate with remaining 1/2 cup of raspberries! Oh wow, that picture looks amazing! I love how you dressed it up and made it look gorgeous. I can't wait to try it! Thanks for linking up with Hump Day Happenings. Lovely colors! and sure looks yummy! What a pretty Raspberry Cheesecake, I just love Raspberries! Thank you so much for sharing this awesome post with Full Plate Thursday and hope you are having a fantastic weekend! oh sounds and looks delish and pretty easy too! Nom nom nom! Thanks for linking to Snickerdoodle Sunday!